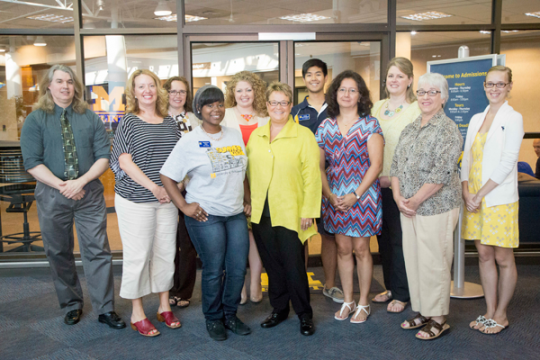 Chancellor Borrego meets with staff and students on her first day at UM-Flint. 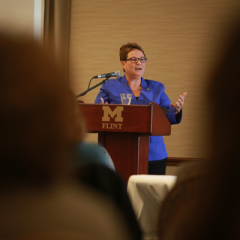 Chancellor Susan E. Borrego officially began her tenure at the University of Michigan-Flint August 4. 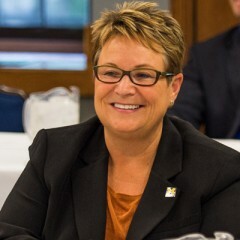 After a nationwide search, Chancellor Borrego’s appointment was approved in April by the University of Michigan Board of Regents. She recently completed work as the Vice President for Enrollment, Planning and Student Affairs at the California State University, Dominguez Hills. 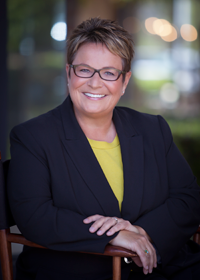 Chancellor Borrego brings with her extensive experience in the areas of student learning and support, enrollment management, student affairs, diversity, and strategic planning. Among her initial priorities, Chancellor Borrego has identified reviewing the campus strategic plan as an important first step. 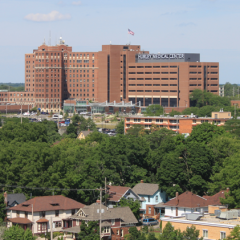 She is planning to bring together faculty, staff, and students to review the priorities of the plan, and to work with people across the campus to identify campus priorities. Chancellor Borrego will reside in the city of Flint, along with her partner, Mary E. Boyce, Ph.D. and their two rescue dogs. Reflecting on the move to her new home, Chancellor Borrego is enthusiastic and proud to be part of the Flint community.